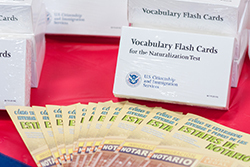 Naturalization is the process of applying to become a U.S. citizen. At ABCD, we offer a range of services at no cost, and we help you every step of the way. ABCD helps people who meet residency and income requirements. We can also help you apply for fee waivers that eliminate application fees. We encourage you to contact us for more information. 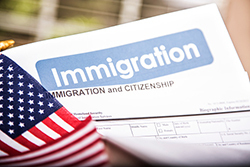 – You must be willing to take an oath of loyalty to the U.S.
A Certificate of Citizenship may be available to you if you were born outside the U.S. and automatically gained U.S. citizenship through birth to or adoption by a U.S. citizen. ABCD’s Immigration Services program is partially funded by Project Citizenship. The ABCD Neighborhood sites listed here have been recognized by the Department of Justice as authorized immigration services providers.